Recent reports from CMHC and the Bank of Canada, highlight developing trends in the ever so important credit cycle. Everyone already knows about the Canadian debt binge which has become the talking point over the past few years and a strong contributor to sky high house prices. Keeping an eye on these trends will be incredibly important moving forward, not just for the housing market, but the Canadian economy as a whole. 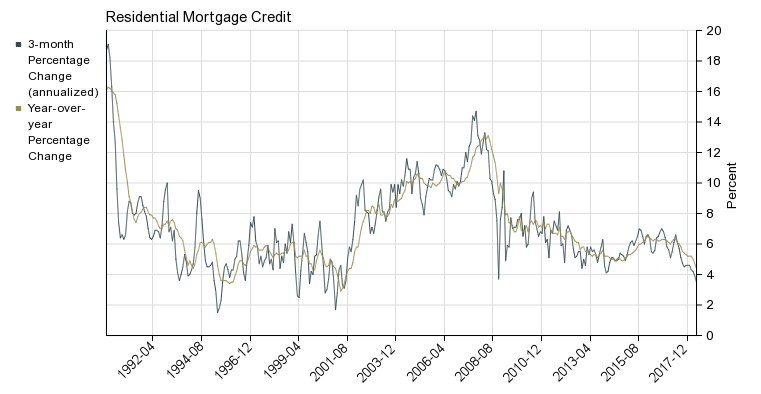 In a post stress test world, mortgage credit growth has been suffering. Recent data as of June 2018 from the Bank of Canada, shows the 12 month percent change of residential mortgage credit has slipped to 4.1%, the slowest pace of growth since May 2001. The 3 month annualized pace slipped to 2.8%, a number last seen in March 2014. With housing affordability stretched to record highs it becomes even more difficult to support current valuations without an increase in new borrowers and borrowing capacity. While the private lending space has been booming in recent years it will be extremely difficult to offset recent weakness in mortgage credit growth. This weakness also made headlines within CMHC, who reported 234,000 new mortgage loans opened in the fourth quarter of 2017, a 7.7% decline compared to the same quarter in 2016. For newly originated mortgages, the average mortgage loan value increased faster than average mortgage debt per consumer, suggesting that the number of borrowers per mortgage was rising. Keep in mind this is also pre mortgage stress test which kicked off in Q1 2018. 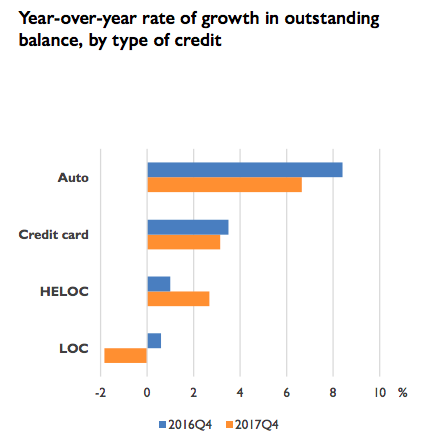 There was growth in the outstanding balances of credit outside of mortgages for major credit instruments, with higher acceleration in auto (6.6%) and credit card loans (3.1%) in the fourth quarter of 2017 compared to a year earlier. The total outstanding HELOC balance increased by 2.7% following growth of 1.2% in the previous year. HELOC’s have been supporting the private lending space.